A book about love, heartbreak, travel, identity, and the accidents of fate, Just One Day shows us how sometimes in order to get found, you first have to get lost. . . and how often the people we are seeking are much closer than we know. This book guys!!!! If you've not read it yet, do it. I'm serious, read it now because you really don't want to miss such a beautiful, heartwarming story about love and self discovery. 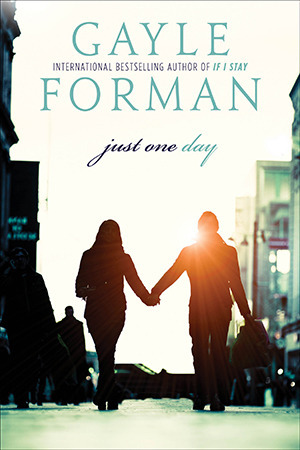 I've never read anything from Gayle Forman before so this was the first time I read her book. And let me tell you, her writing is so beautiful, it touches all the right place that made me have all the feels. Just One Day is filled with a lot of meaningful messages and inspirations that it made me want to try different things. I'm kind of like Allyson, my life is always planned and ordered. I never believe in accident or ever let myself be in the situation that I can be surprised (I always need to know what will happen, it's like I have my life map out and I just follow it---kind of boring now that I think about it.) It's not like it's the wrong thing to do but reading this book made me wonder if I've missed out life. Sometimes you just have to let the wind take you where it may and stop for minute to enjoy the moment. Gayle Forman is a fantastic writer because she wrote a story that can relate to so many people, to verbalize thing that we can't say and to encourage us to be brave and do thing out of our comfort zone, to explore the possibilities of life. I don't know what more can I say except please read this book because this is something you just have to experience for yourself.